Cody wincing in pain as she laughs at Sam having to take his clothes off to model for Stefano Gold. 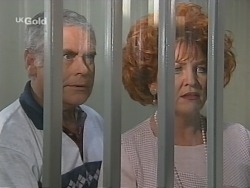 Marlene being told by Sheriff Rafferty to accompany Constable Harris to the police station about her unpaid parking fines. CODY: This might sound really, weird, right, but I reckon this has been a good experience for me. I mean, I prefer I didn't get shot – I'm not a total loony! – but it's taught me something: what it's like to be a patient. Karl tells her that he never had any doubt that she'd be a fine doctor, and what she just said simply confirms that. Marlene is being escorted into a cell, complaining to a police officer as she does so that he's treating her like a Nazi. The officer asks her if she wants to speak to her grandson. Marlene retorts that she does. She's escorted into a visiting room with bars. Jo and Sam are standing on the other side and Sam points out to his nan curtly that he *warned* her that they'd haul her off and chuck away the key. Marlene asks who's going to run her shop and do her radio programme. Sam snaps at her to stop: if she'd paid the fines, none of this would have happened. Marlene just retorts that if the police think she's going to sit down and take this, they've got another think coming. Sam storms off in a fury. The police officer takes Marlene back to her cell. CODY: Be nice, though, don't you think, if there *was* something else. Do *you* believe in life after death? PAM: Oh... I don't know. I'd *like* to. It's just the conventional idea of heaven has never really made much sense to me. It all sounds a bit boring, to tell you the truth! Cody says she might think about it from now on. The ‘phone at Cody's beside rings suddenly. Pam answers and then hands the ‘phone to Cody. It's Doug! Pam yells down the ‘phone not to make Cody laugh! Stonie, Libby and Mal walk into the coffee shop, Stonie raving that Port Keats sounds ace! Mal orders three shakes and then asks Stonie if his drama piece is ready for tomorrow. Stonie sighs that he's freaking; he's got to come up with something good. Libby suggests that she video what he's got and he can see if it's working. She heads off to get her video gear. Sam and Jo walk into No. 24, Sam telling Jo that all Marlene has to do to get out of jail is pay the fines; simple. Jo points out that he knows what his nan's like – and she can't help thinking about her all alone in that terrible place. Marlene is talking to a police officer about the horse racing, a newspaper in her hand! As the officer goes to get her some dinner, a cat wanders into the call and Marlene exclaims that it's Colonel Parker: he lives in her shop! The officer says he's Taggart to them – he's the station cat, but he often goes walkabout for a couple of days. 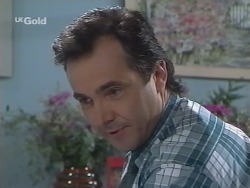 He hands Taggart to Marlene and she smiles that she won't be lonely *now*. The officer then tells her that she has some visitors. 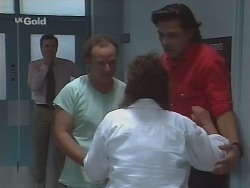 Marlene heads through to the visiting area, where Lou and Cheryl are waiting on the other side of the bars. 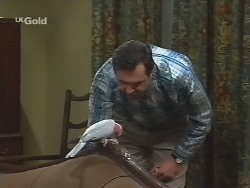 Lou asks Marlene in surprise what the cat is doing there and she grins that he's just visiting. Cheryl then tells Marlene that she's brought her some food and some reading matter. Marlene, however, says she needn't have bothered: they've just gone to get her some roast beef and vegetables. Cheryl looks aghast that the place seems more like a holiday than a jail! Pam is looking around No. 28, commenting to Karl and Susan that there are so many memories. Karl says he looked under the house for Doug's home brew. Pam, however, says Doug had a pretty good idea where it might be. 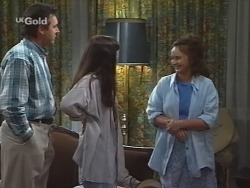 The two women go to look as Karl wanders over to Dahl, who's hopping around on the couch, and warns him not to leave any unwanted deposits on it! He adds that he knows the bird is missing Brett. Susan and Pam come back in, Susan holding a box. Karl asks where they found it and Susan explains that it was in the roof. Pam suggests Karl try some of Doug's home brew. Karl takes a couple of bottles out of the box and puts them in the ‘fridge! Sam is trying to work out what takeaway to order, but Jo asks him how he can think about food at a time like this. Sam insists that he's just as upset as she is about Marlene being locked up, but how can she expect them to help her if she's not going to help herself? Jo suggests that they cook one of her favourite meals and take it down there. Sam, however, points out that the police going to feed her; it won't be quite what she's used to, but a good dose of cop shop fare will be just what she needs to have some sense knocked into her. Cheryl comes in through the back door at that moment and invites Jo and Sam to come over to their place for dinner and to wish Lou happy birthday before he rides off into the sunset at Lauren's ranch. Jo says they were wondering if they should take some food down to Marlene. Cheryl, however, tells her that she's already done that, but she couldn't compete with the five- star service her mother is already getting – she's even got her cat in the cell with her! Sam snaps in annoyance that she's supposed to be learning a lesson, but now she *never* will. It's evening- time. Stonie is talking on the ‘phone behind the counter while Mal and Libby try to decide whether there's enough light to film outside. 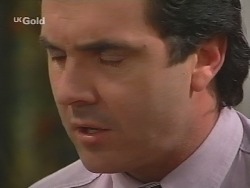 Stonie hangs up and tells Mal and Libby that the shoot's off: his mum's got a shocking headache so he's got to work at the coffee shop. Mal exclaims that they can film *there*. Stonie tries to protest that it's a bit raw. Mal, however, points out that this is for Stonie's art! Karl takes a sip of Doug's home brew and then burps! He laughs and says it just slipped out! Pam tells him that he may as well keep it so it doesn't explode on the ‘plane on the way home. Karl asks her if she's sure. Pam insists that she's positive – although Doug might argue the point if he was there... Her voice trails off. Karl assures her that she doesn't have to worry about Cody: she'll be up and about in no time. MAL: Yes, let's hear it for the fantastic Stoneman, ladies and gentleman! KARL: Really, I understand. I'm sure *Cody* understands. PAM: Oh yes, she understands. It's just me. I mean, he wanted to come for both of us, but there's no way he can leave Vanumatu right now. The job's very demanding. And to be honest... well, we really need the money. We have for a while. She stands there looking embarrassed. Susan looks at Karl and then tells Pam that everything will be OK – she's sure. STONIE: Are you joking? Look, where's the tape? I need to have a look at it to see if I can salvage anything. I'm desperate and I'm running out of time. Libby tells him that it's in the machine. She heads off to school. Stonie puts the tape on. Karl joins him and Mal to watch it. He looks bemused at what he sees! PAM: We're going to have a bit of a family reunion. I think we'll be able to afford an airfare to Darwin by then. CODY (grins): Excellent! I'll go fishing with dad – see if he's as good as he makes out in his letters! PAM: You won't recognise Zack – he's *huge*. I've got some photos. She goes to get them from her bag. All of a sudden, Cody starts wincing in pain and shaking. Pam turns round as Cody grimaces. She yells for someone to come and help her. KARL: My taxes are paying for you to *do* that?! Where did you get such a stupid idea? Karl muses that it's got energy – but he thinks it needs more humour: you should always leave your audience laughing. His beeper suddenly goes off. He looks at it and shock crosses his face as he reads the message. He leaps up and says he's got to go. SAM: She's gonna be OK. She's gonna be OK. SURGEON: I'm sorry, Mrs. Willis, we did everything we could. Sam stands there looking stunned. Pam leans against a wall, sobbing heavily.